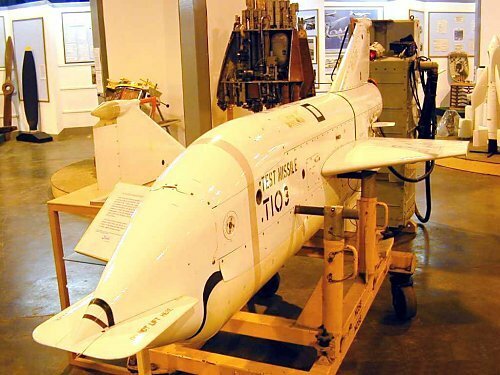 An Ikara missile preserved at Australia's Museum of Flight, Nowra. 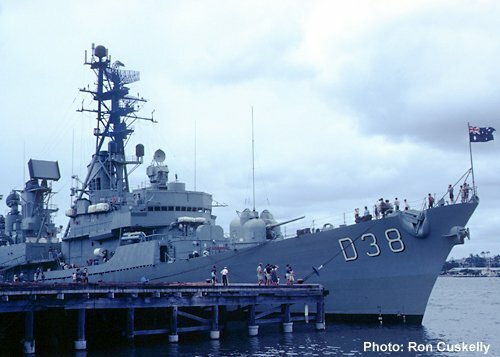 The Charles F. Adams class destroyer (DDG) HMAS Perth at Brisbane in 1966. Adastra was approached by the Royal Australian Navy and the Department of Supply in July 1967 with a request to quote for survey style photography of the Ikara sea trials. Being a prestigious client it was an ideal contract to look to, and we were delighted to win it. To clarify operational details, including the security angle, Lionel Van Praag and I were invited aboard HMAS Perth to meet the Navy team running the trials. This was on 26th July when the ship was based in Sydney. At that time, 1967, Ikara was in the top secret bracket and security was a concern to them. Cdr. Ike Wilson was the RAN director of the trials, and the Department of Supply's representative was Malcolm Barrett. The latter, who retained that role for the duration of the trials, was a most helpful liaison officer, and flew with us, as observer, on several sorties. On 8th August 1967, we took Hudson VH-AGP down to HMAS Albatross, a shore station at Naval Air Station Nowra, south of Sydney where we had a further briefing and later enjoyed the hospitality of the wardroom. However, this first trial ran into a series of problems, not only with the Ikara launch, but also with ship/aircraft communication, and when bad weather arrived the trial was scrubbed. Our debriefing back at Adastra's base at Mascot led to some disquiet. We had flown seven sorties over a four day period and there was concern over the amount of time that one of our survey units had been committed to the work with no result. As it turned out, however, in the long run, this initial trial proved its worth in that liaison became smoother, many of the technical glitches were ironed out, and aborted trials in the years ahead were often due to low cloud or a heavy sea state. Lionel and I attended the Navy's debrief on 11th August at HMAS Rushcutter, the naval depot. The client also expressed concern, and after a long meeting, decided that more time was needed to solve their own problems. On 17th November we were again invited to Rushcutter to what was labelled the Sea Trials Conference. Although this was another lengthy affair, greater confidence was evident and a second trial was set down for 13th December. For the second trial (VH-AGX, same crew) we flew first to the RAN strip at Jervis Bay and picked up as observer, Lt. Taff Hughes. Over three days, we again flew seven sorties, but this time came back with positive photography, both colour and black and white. Our client expressed complete satisfaction with the results and we were assured of an on-going contract for the duration of the trials. On a number of the early trials we were advised by the control ship of a Grumman Tracker operating in the firing zone, but at a safe altitude below us. What we discovered was that the Tracker was also following the missile after launch. This intrigued Lionel and me. But, as it transpired, any suspicions that the Navy boys were setting up their own photographic unit were groundless. Some years later, in June 1973, the Trackers again appeared in the firing zone. We had been asked to prepare for a new style of two-day trials, one day to involve infra red film for the standard Ikara firing, and day two to cover, with colour film, a torpedo launch from a Tracker. There were six such trials that year. Once again results were mixed, my notes indicating positive outcomes on only five days, the remainder being spoilt by misfirings, rain or heavy sea state. The camera nominated by the client was the standard Wild RC8 with a 6 inch focal length lens. At one of the RAN debriefings the problem of low cloud and the ensuing reduced photographic coverage was discussed. This prompted me to suggest using the RC9 (focal length 3.5 inches). Perhaps because their plotting set up was based on the 6 inch lens, they were reluctant to switch cameras. Further discussion led to the idea of using the two cameras on the same trial. Of course our only aircraft with dual camera hatches was the DC-3 VH-AGU. The first chance to put the proposal into practice was on 17th February 1970 - one of the sorties described in Peter Shute's account which follows. (The crew was Dave Brennan, pilot, Lionel co-pilot, Peter Shute and John Collins on cameras and myself as navigator.) As it happened, the weather was almost cloudless and the colour imagery from the RC8 gave the client his requirement, with the black and white shorter focal length coverage being of curiosity value only. The experiment was not repeated, even though AGU was often available for subsequent trials. Earlier I mentioned technical glitches being ironed out. If this had been 100%, our contract would not have lasted the six or seven years that it did. Indeed, one memorable trial in March 1970 caused a deal of consternation. John Collins and I were in the Cessna 185 VH-AGE, and at launch, with camera rolling, we were just starting to follow the missile when its guidance system went awry. It doubled back on its track and splashed down dangerously close to the launch vessel. There was a sudden deathly silence on the airwaves and we stooged around awaiting instructions. Some time later, a subdued voice announced shut down of the trial and we headed home, but with the evidence of a genuine near miss. We were always made welcome in the wardroom when overnighting at Albatross. This was an experience we all enjoyed, but probably more so by the younger members of our crew, who would have been new to the sometimes arcane traditions of an officers' mess. As our operations became routine, preflight briefings were more commonly held in Sydney and we found it expedient to obtain A.T.C. clearance at Mascot and fly directly to the firing zone. Thus, overnights at Albatross became infrequent. Peter Shute's account (which follows) mentions the use of marker dye. My understanding of its purpose was to fix the splashdown point of the missile. Basic photogrammetry would then provide track and distance and confirm the accuracy or otherwise of the firing. On only one occasion of the 50 odd trilas I'd flown on, were we asked to help locate the torpedo, which was designed to surface at the end of its run. I assume it was tracked by a version of Asdic, and its recovery was routine. By far the aircraft which featured most in the Ikara trials was the Cessna 185 VH-AGE. Naturally it was more economical than a Hudson or the DC-3, and it was also the first of our light aircraft to be converted to a two-man operation. (The "Flying Gregorys" in the Aero Commander VH-AGA had been operating as a tandem team before this, but that handsome duo deserve a separate story). To both operate the camera and at the same time navigate the aircraft within prescribed tolerances required a high level of experience. This was especially so over poorly mapped terrain and we found that younger crew members had difficulty with the task. Sadly, the concept of training (except, of course, for pilot conversion) was quite foreign to Adastra's administrative wing. New crews were usually thrown in at the deep end, so to speak, and as a consequence a lot of their work was rejected. This philosophy always irked operational personnel. Adastra's involvement in the testing of the Royal Australian Navy's Ikara anti-submarine missile system is another unusual task undertaken by the company. The Ikara system comprised a torpedo hung under a missile launch vehicle. It was fired in the known direction of a submarine and at a determined time the torpedo detached and descended under a parachute. On entering the water, the parachute detached and the torpedo homed on the target acoustically. For the purpose of the trials, the torpedo discharged a fluorescent dye where it entered the water. Our role was to orbit just behind the launch vessel and time our run in with the count-down to firing. There were a few misfires or holdups on each occasion but we managed to be in the right place when it fired. The thing took off with a great plume of white smoke from the boosters and it was quite easy to follow the missile itself as it tracked above the water when they had cut out. The aim was for the overlapped photographs to show the flight from start to finish, with it's water entry point marked by the dye. The trials were conducted several miles out to sea from Nowra. For one of the trials, Brian Costello, Mike Wood and I overnighted at the Nowra Naval Base and were treated well in the Officers' Mess. One other occasion was with Lionel Van Praag doing the flying. We had all signed the official secrets act and were told to use the code names for the various vessels involved, of which there were three or four surface ships and the sub. Obviously, we had radio contact with the launch ship. After a bit of stooging around with a delay or two, Lionel was getting a bit impatient and either couldn't remember, or couldn't be bothered to remember, the code names. As a result he was saying things like "We're orbiting five miles west of Perth" (the ship, that is!). Angry voices asked him to use the code names but I don't think he did for the whole exercise. While these were not the first live firings, the system was still on the secret list at the time. Whether they thought there was a Russian "trawler" just over the horizon I don't know! On the trip with Brian, he did the regulation beat-up of the ships at the end of the trials and I took several photographs of the ships with the survey camera. This had to be timed well with the pilot because there was a delay of a second or two from pushing the button to the camera firing. Either way, we managed to get some good vertical and oblique shots which I saw when the negatives were developed back at Mascot. Unfortunately, for security reasons, the Navy wouldn't let them print any for us. 02APR70 Cessna 185 VH-AGE Jervis Bay area and to Albion Park 5:50 Survey 10,000 ft. The HMAS Torrens sails up the Brisbane River during a Royal visit in 1982. Ikara (Throwing Stick) was an Australian designed anti-submarine missile system which could carry a Mark 44 torpedo to the vicinity of an enemy submarine. The torpedo would descend to the sea by parachute and commence a spiral search pattern to locate the submarine by acoustic means. 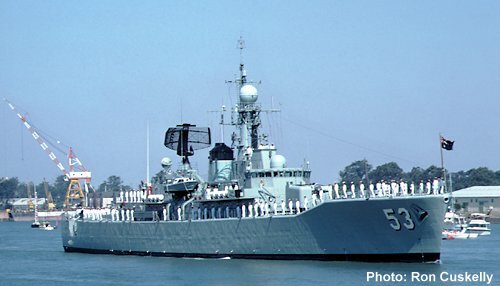 Ikara was first fitted to the River Class frigate HMAS Stuart which was commissioned in June 1965 and which featured prominently in the development of the system. HMAS Derwent was fitted with Ikara in November 1965 and the system was also fitted to HMAS Parramatta and HMAS Yarra during refits in 1967. HMAS Swan and HMAS Torrens were equipped with Ikara while being built. The River class frigates each carried one Ikara launcher. These vessels were redesignated as destroyer escorts in 1969. The Ikara system was also fitted to the three Charles F. Adams class destroyers (DDG) HMAS Perth, HMAS Brisbane and HMAS Hobart which each carried two launchers. The system was also sold to the Royal Navy and the Brazilian Navy. Ikara had been declared obsolete and removed from all three DDGs by 1991. HMAS Perth, on which Adastra's involvement with Ikara began, was sunk as a dive wreck off the coast of Albany, Western Australia on 24th November 2001. HMAS Torrens (depicted above) was sunk off the coast from Perth, Western Australia on 14th June 1999 in a much-publicised demonstration of a Mark 48 torpedo fired by the submarine HMAS Farncomb. Prime Contractor Australian Department of Manufacturing Industry. Power Dual thrust solid propellant rocket motor. Guidance Radio/Radar guidance/tracking system, receiving signals from automatic target prediction equipment on board the launch vessel. The missile is controlled via elevons. Warhead American Type 44 lightweight acoustical homing torpedo, or other types of torpedo. Wing Span 5ft 0in (1.53m) Wings are quickly detachable for storage.